Is it possible to prevent Podium from using all cores while rendering? The trouble is that at work I am unable to render during work hours. I don't think so, but I'm not sure I understand the issue. Well you can always use V1.5. Podium>settings>have unchecked multithread option, should work. And I'm also do not understand this issue too. Podium>settings>have unchecked multithread option, should work. I was going to complain that we PC users also want that feature, then I realised that we have millions of features and apps that Mac users do not and probably never will have, so I'll let this one slide. Yes, your right Pete.....and of course it begs the question... why you would want to ever turn off multi threading?......Mac people enjoy slower renders? hey solo and stu, clozer was asking for this, then I remember version 1.6 in vm ware, this option was there but was not working. A vm ware problem probably. And of course mac users enjoy real slow renderings with 64 bit systems and only 2gb ram lol. Try hackintosh and you' ll see. But what can we do without 3ds and auto-cad? again lol lol lol. Come on this is for fun anyway. PCs are fine. whaaaaaaaat?! 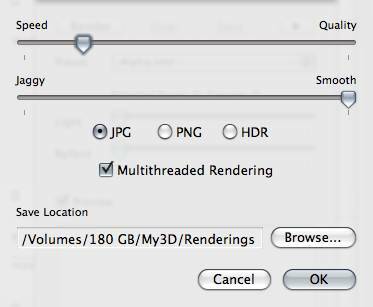 The Mac version can disable multi-threading? The reason i want to be able to turn off MT is so I can use other programs while the render is running. Other programs currently become extremely slow without that. Yes i suppose i could use 1.5- except that many settings would have to be changed. Thanks! That is what I was looking for. Is there any way to farm machines together? I have three duo quad core machines and would like to use them all at once?